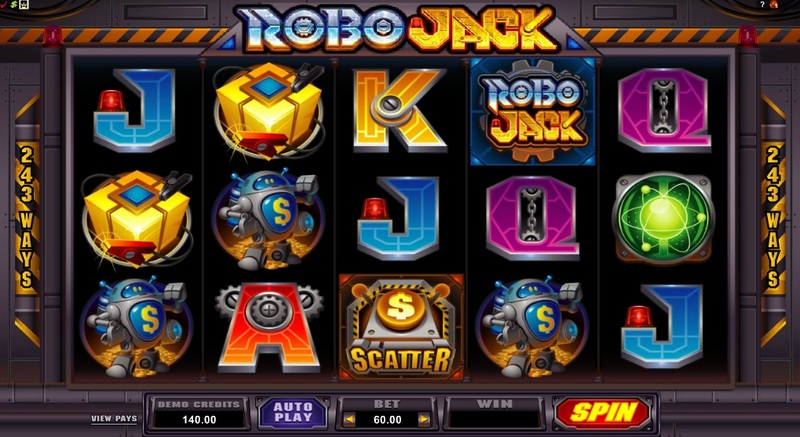 When I saw that prestigious slot developer Microgaming was releasing a slots title called Robo Jack the first thing that came into my head was that it was going to be some weird mash up of Robocop and Short Circuit that looked a bit cheaper than Wall-E. At first impressions, I was not too far off! This 5 reel, 243 ways to win slot was released at the same time as the promising release of Fish Party so having held a positive view on that slot I was quietly optimistic about this slot. I mean, robots and slots... who doesn't love that combination?! The graphics weren't the best but the reels were full of cool symbols such as a cash box, a robot with a $ sign on his chest, a random robotic cube and regular symbols made out of metal. This slot was beginning to feel like a real taste of retro. Look Out for the Wild! 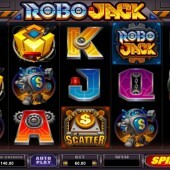 The Wild symbol is represented by the Robo Jack logo symbol which is staple trait for a Microgaming slot to have the logo as the Wild. It substitutes for all other symbols, except for the Scatters, to complete winning combinations. Earn up to 60 Free Spins! The Scatters are in the shape of the robot with the word Scatter written on it. If you hit three or more of these across the reels then you will trigger the free spins bonus round. Once the free spins bonus round has been triggered, you will be given the chance to add one of five bonus features during the free spins awarded, which can total up to a staggering 60 spins. These bonus features are kept in storage tanks and are revealed one-by-one until you accept one to play with and they include Random Wilds, Wild Reels, Extra Wilds, and the addition of multiplier values to any wins you hit during the free spins. Unfortunately, that was it for Robo Jack. It did mean I felt a bit short changed from the slot. Its only real attraction was a free spins bonus round. Yes, there were bonus features that could be added to the free spins but there was no other interactive bonus features or any more levels to the game. It felt very one dimensional and compared to something like NetEnt's slightly more enjoyable Alien Robots, I was having a deja vu feeling all over again that I was experiencing playing Microgaming's very own Spacebotz. Yes, to sum it up, this slot feels like Spacebotz v1.5. I was pessimistic, then I became optimistic, but by the time I had finished playing this slot I was underwhelmed. Not a total failure of a slot release but it had so much more to give than it actually did.